Sub Pop is a legendary record label based in Seattle that has signed great bands like The Shins, The Postal Service and Nirvana. They recently celebrated their 2oth anniversary and they have a great site full of artist info, photography and a Listen feature which allows users to stream music. However, when purchasing music, the transactional flow of the site is confusing. 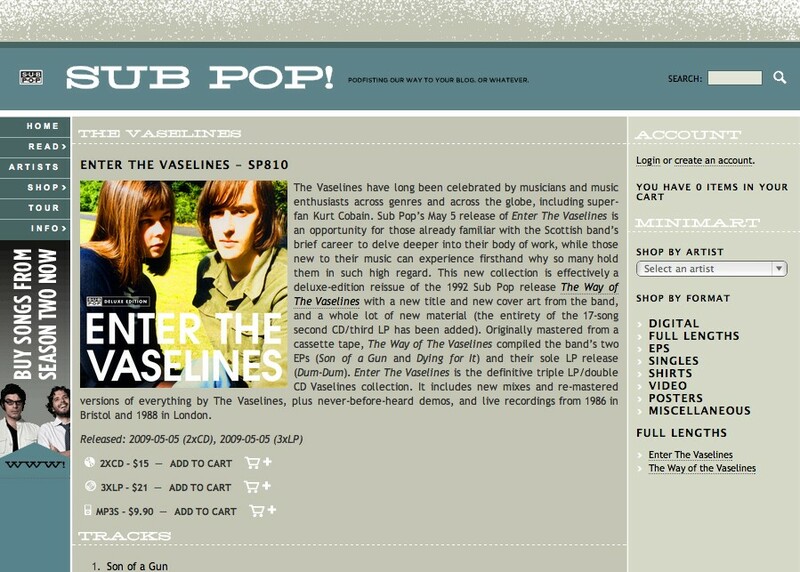 After adding an album (in MP3S format) by the Vaselines to the the shopping cart, I noticed several options including login, create an account, a delete icon, a link to the album and a checkout icon. However, a few of these items were unclear. I'm not sure why one would want to create an account (from the shopping cart) and there is no helpful information on the subsequent 'Sign Up' screen to explain the benefit or creating an account. The login and account options would be better placed outside the context of the shopping cart area or simply introduced at the beginning of the checkout process. I finally clicked the Checkout icon and began the transaction process. But on the third screen, I was asked to enter a shipping address! I thought I was downloading the digital MP3S format so why would I need to provide a shipping address? The site should contextually recognize that I am purchasing a digital version of an album and bypass the shipping address screen. This type of confusing transactional flow will frustrate users and may cause them to abandon the shopping cart altogether. Sub Pop should minimize the number of choices in the Account area by removing login and create an account and make the flow more contextual by requiring users to enter only the information they need for that purchase. 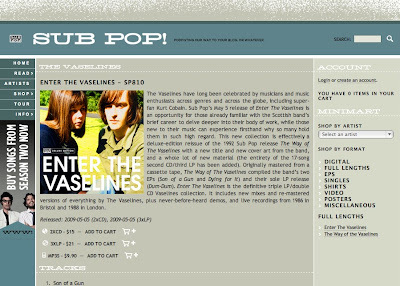 These changes would improve the overall music user experience of the site.